I was faced a problem in Vista today. 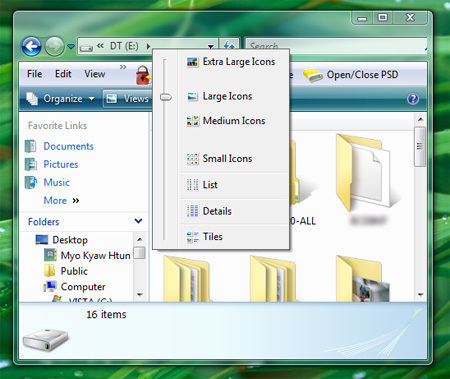 The problem is that all of the folder-names and file-names were missing in large folder view under my drive in Vista. But I can see under sub folders. Strange ? huh. Take a look at the following snapshot. 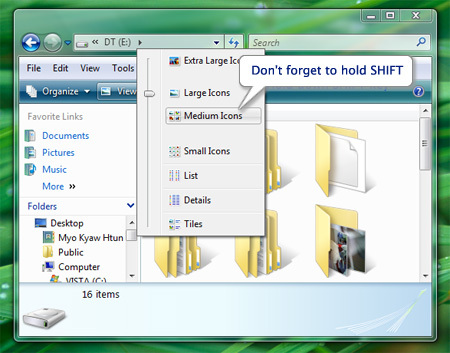 That is always happened when we hold the SHIFT key while we’re opening the drive or folder in Vista. To solve this problem, follow the steps. 1. Switch to detail view. 2. Hold down SHIFT key and change to “Medium Icons”. 3. Close the Explorer and re-open it again. 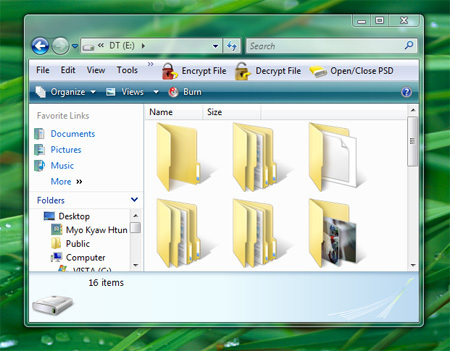 There you’ll get your folder names and file names back. update: It is also happened in XP. I just found an interesting site called TwitterFeed that allows you to sent posts, published in your blogs, to your twitter. You need to have twitter account and OpenID account which is needed to login to TwitterFeed. To get openID account, try myopenid or myvidoop. This is my twitter you can follow.